The film opens with a mysterious harmonica-playing gunman (Charles Bronson), whom Cheyenne later dubs "Harmonica", shooting three men sent by Frank to kill him. In a roadhouse on the way to Sweetwater, where he also encounters Mrs McBain, Harmonica informs Cheyenne that the three gunfighters appeared to be posing as Cheyenne's men. Cheyenne arrives at Sweetwater soon after and both men seem attracted to Mrs McBain. Harmonica explains that, according to the contract of sale, she will lose Sweetwater unless the station is built by the time the track's construction crews reach that point, so Cheyenne puts his men to work building it. 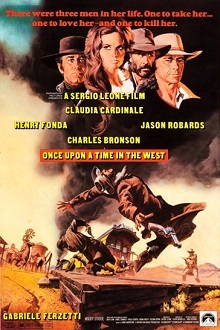 Following the film's completion, Once Upon a Time in the West was dubbed into several languages, including Italian, French, German, Spanish and English. For the English dub, the voices of much of the American cast, including Fonda, Bronson, Jason Robards, Jack Elam, Wynn, Wolff and Lionel Stander, were used. However, the rest of the cast had to be dubbed by other actors, including Ferzetti, who was dubbed by actor Bernard Grant (who is believed to have voiced Gian Maria Volonté and Aldo Giuffrè in the Dollars Trilogy), and Claudia Cardinale, who was voiced by Grant's wife, Joyce Gordon. In 2008, Empire held a poll of "The 500 Greatest Movies of All Time", taking votes from 10,000 readers, 150 filmmakers and 50 film critics. "Once Upon a Time in the West" was voted in at number 14, the highest Western on the list. In 2017, it was then ranked at number 52 on Empire’s poll for “The 100 Greatest Movies” (the second highest Western on the list). In Italy, a 175-minute director's cut features a yellow tint filter, and several scenes augmented with additional material. This director's cut was available on home video until the early 2000s, and still airs on TV, but more recent home video releases have used the international cut.